A new look at an asteroid in deep space has revealed signs of a molten-hot core, a smoldering remnant from the earliest days of the solar system that could also help unlock secrets of some of Earth's weirdest meteorites, researchers say. At the heart of the new study is the asteroid 21 Lutetia, one of the millions of rocks in the asteroid belt between Mars and Jupiter. The European Space Agency's Rosetta probe flew by 21 Lutetia in 2010, providing scientists with their first detailed look at a large asteroid. 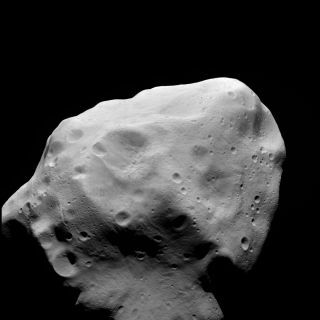 Measurements of Lutetia have found it to be unusually dense for an asteroid. Because its surface appears porous, its density could be explained by a heart of molten metal, similar to those of planets like Earth. If so, scientists say, Lutetia might be an example of arrested development: a body that, in the solar system's infancy, was on its way toward growing into a planet but never got there. It could also help explain the origins of mysterious magnetic meteorites on Earth, scientists added. Asteroids in the main belt are mostly relatively small and light, with fissures and voids reaching all the way into their interiors that make them very porous. Close-up images of Lutetia taken by the probe revealed cracks and craters run across its battered surface, too. The scientists created a model of Lutetia's shape based on images taken by Rosetta's Optical, Spectroscopic, and Infrared Remote Imaging System (OSIRIS). Holger Sierks at the Max Planck Institute for Solar System Research in Germany and his colleagues estimated the asteroid's size to be 75 miles long, 63 miles tall and 47 miles wide (121 by 101 by 75 kilometers). The research team next calculated the asteroid's mass by noting how Lutetia's gravitational field distorted radio signals from Rosetta. The strength of a body's gravitational field is directly related to its mass, and the amount of distortion suggested the asteroid is 1.8 million billion tons (1.7 million billion metric tons). Once the scientists knew the asteroid's volume and mass, they could determine its density. Martin Pätzold at the University of Cologne in Germany and his colleagues found the density to one of highest ever calculated for an asteroid: approximately 212 pounds per cubic foot (3,400 kilograms per cubic meter), or nearly as dense as diamond. Since the huge fractures seen on Lutetia's surface hint that its crust is porous, researchers accounted for the asteroid's density by suggesting it has a molten core. This could mean "that there is a whole spectrum of strange planetary beasts that formed in between primordial and fully differentiated bodies," Weiss told SPACE.com. The scientists detailed their findings in three papers in the Oct. 28 issue of the journal Science. As the solar system began to form about 4.5 billion years ago, planets were born from collisions of dust and rock. The numerous chunks that stayed relatively small formed asteroids, while others eventually grew through accretion to the size of planets. These worlds once were extraordinarily hot, but they eventually cooled from the outside, forming a crust around a molten core. Lutetia may be a case of arrested planetary development: a body large enough to develop and retain a molten core, yet not reach planetary size. "The planets don't retain a record of these early differentiation processes," Weiss said. "This asteroid may be a relic of the first events of melting in a body." Asteroids with molten cores could help explain mysteriously magnetic meteorites seen on Earth. Weiss and his colleagues have suggested that such magnetization most likely occurred in asteroids with a molten metallic core — a big shift from the traditional picture of an asteroid as a primordial, unmelted objects. "The origin of this magnetization has been a key unsolved problem for nearly five decades," Weiss said. "If asteroids are partially differentiated, they could have formed molten metallic cores that generated ancient magnetic fields. These fields could explain the magnetization observed in many kinds of primitive meteorites." To confirm whether any given asteroid actually did have a molten core, scientists could take samples directly from it. A NASA team is currently planning to launch a probe in 2016 that will take a sample from an asteroid and return it to Earth. "The challenge is, the body has to be big," Weiss said. "If it's not big, then it's not going to retain a molten interior. The problem then is, all the big bodies are not going to be easily excavated."